I am the owner of DC Paddleboards and stoked to be able to say that I’ve been creating surf and paddle-boards for over 34 years – it’s my passion. We are not a large production company, we are a boutique board company that handcrafts custom boards for our customers. You wont find many of our boards in surf shops as we make to order. Over the years I have developed a natural flair for shaping and design, supported by years of experience surfing in contests globally. As a result Dale Chapman Surf Designs and DC paddleboards have produced over 25,000 boards. Any good shaper will tell you, its all about touch and feel. This comes from experience, and most importantly you have to love it. Any board designed and made in my factory is treated like my own. The last 30 years have been like a roller coast ride. I have spent little time marketing my brand or advertising my product/service. Actually I'd rather shape a board or be in a barrel than talk marketing. My brand is recognised throughout global markets, there are people riding my boards all over the world. I'm confident they will tell you, they are stoked with their board. This demonstrates the success of my business, its been bulit up by my customers and I'm very appreciative, grateful and super proud. I hand craft and produce surfboards, stand up paddleboards and foil boards from my factory in Currumbin Gold Coast, Australia. Each board is designed to suit the individual customer starting with weight, rocker, and nose and tail design and continuing through to the colours, spray and decals. I personally shape, glass, and oversee production of every board DC Paddleboards creates, ensuring each one is made with a unique level of precision that results in an innovative and cutting-edge design. DC Paddleboards is one of two surf companies that custom-make the Surf, Sup Boards in Australia. I’m proud to be one of them. Our boards are 100% designed, and manufactured in Australia. We are passionate about keeping surfboard industry jobs in Australia. DC Paddleboards includes a team of extraordinary board engineers, sprayers and team riders all of which contribute to research and design. As a team, we keep on top of industry trends and the latest technology and materials which results in superior design and production. On average, DC Paddleboards creates several hundred boards. These boards are shipped into both domestic and global markets. Our success is based on the fact that we listen to what our customers want, understand what they are hoping to achieve on the water, and deliver a board that will exceed their expectations. DC Paddleboards has a strong relationship with NSP, which is one of the largest global board production companies. We provide NSP with a wide range of NSP DC production board designs for both surf SUP’s, foil surfboards and foil SUP boards annually. Dale Chapman personally shapes the prototypes in Thailand, the boards are then mass-produced and distributed throughout 76 countries. The relationship between NSP and DC Paddleboards enables us to create superior, Australian designs and shapes that reach the enthusiastic paddler, foiler, surfer and elite paddlers internationally through NSP distributors. Over the years, this relationship has grown in strength and DC Paddleboards can proudly say we’ve worked in collaboration with NSP on numerous designs. The difference between DC Paddleboards and the competition is that Dale Chapman, owner, designer and master shaper, is hands-on starting from the design process and continuing through to the manufacturing of all boards produced from the DC paddleboard factory. 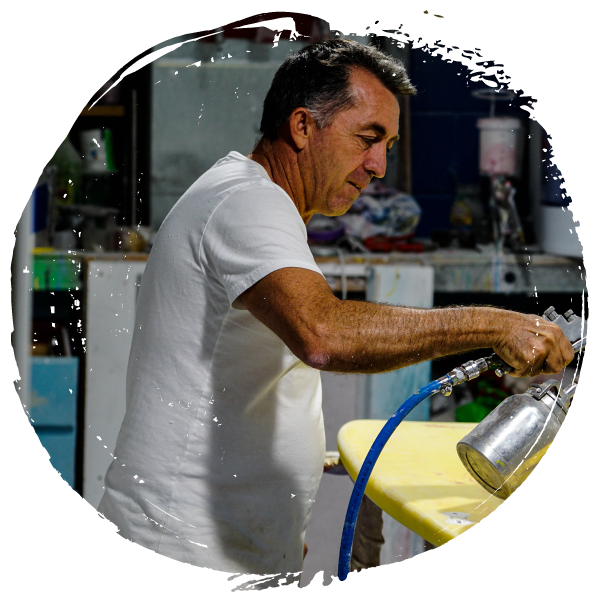 Dale Chapman has over 35 years of experience in designing and shaping short boards, SUP boards, surf boards, and foil boards. In fact, Dale Chapman has produced in excess of 22,000 short boards and over 1000+ stand up paddleboards from the DC Paddleboard factory in Currumbin, Gold Coast Australia. DC Paddleboards stands out in a competitive market. The designs are powered by an engine room of designers that compete at an elite level. Dale Chapman heads up an outstanding design team consisting of board designers, shapers and some of the best sprayers in the industry. The team works in collaboration with Dale to produce exceptional board designs and prototypes which are then produced for our customers. Research and development plays a crucial role to the design cycle. Dale Chapman, along with his team riders, prides himself on racing upcoming designs to ensure they are perfected prior to manufacturing. Dale personally-overseas the machining process, then hand shapes the blank. He will tell you this process is all about the touch and feel which comes from years of experience. Every board goes through a quality control process to ensure its ready for the water. DC Paddleboards also designs surf sups and race boards for NSP globally. Allain works closely with DC NSP team rider and current World Champion Travis Grant. Together, this dynamic trio produce world class designs. The future looks extremely bright for DC Paddleboards. For Dale Chapman the last 35 years of surfing, foiling and paddling locally and internationally combined with personally shaping and designing thousands of boards has created a platform where the business can confidently push design barriers to the limits. The business has the maturity to take risks with design and production, which is transparent in 2018-2019 board designs and special projects. 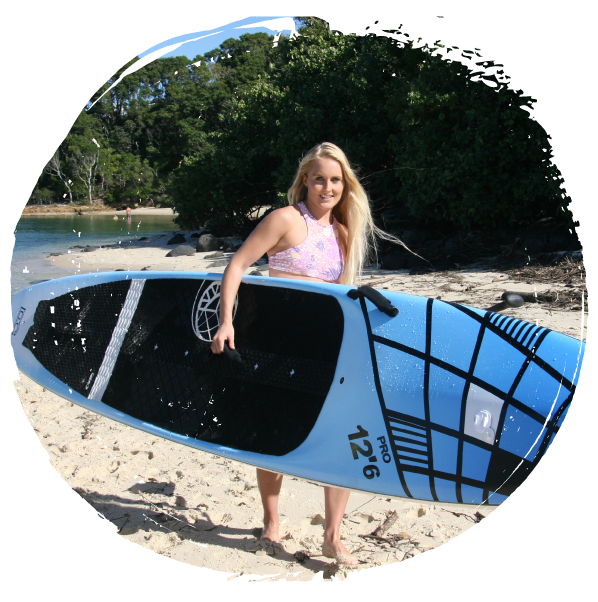 Our vision is to ensure our locally shaped and designed custom stand up boards and Australian production board designs are available to both the elite through to the leisure paddler within global markets. We are enthusiastic about our research and development programs supported by our passionate team riders, together we will strive to test and race our boards within International recognised sup playgrounds and races from the M20 Maui to Oahu to Westerns Australia east coast The Doctor. Our main objective is to make available to our customers state of art boards that have been tried and tested by expert paddlers in the ultimate sup conditions. Growing up in Mermaid Beach, Gold Coast I found myself involved with the local surf club, that’s where it all started. In fact I have a long connection with Victoria Surf Life Saving through my Grandfather being a foundation member of the Torquay SLSC. Living in Ventura road Mermaid Gold Coast just a few meters from the beach was the ideal spot for a young grom like myself. It was a natural progression to move into surfing, I clearly remember looking at the boys out the back and wanted a piece of the action. Surfing was my thing from the age of 13. Riding a 5’4” twin fin at the age of 14 years I won my first surf contest at Miami High School, shortly afterwards I was riding for Mango Billabong and Hot Tuna as a kid. Over the years I have owned various companies, Doctor Ding Surf Repairs, Shapetech, DC Surf Design and Chapman Surf Boards. 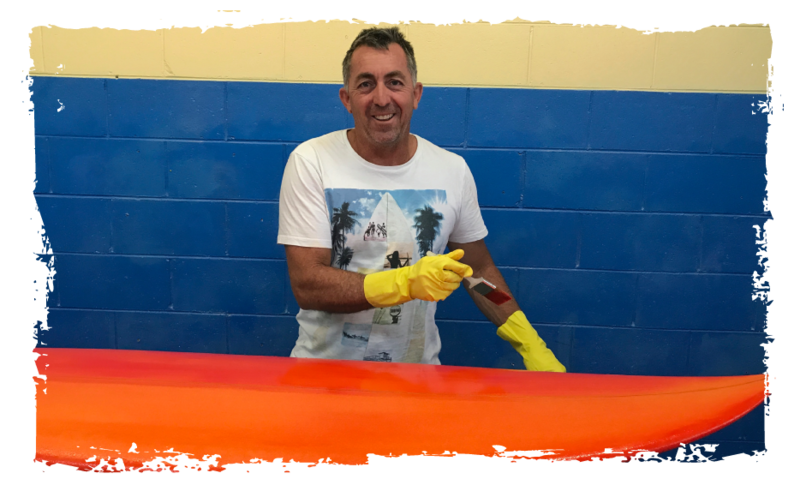 My surfboard shaping years were great having worked with City Beach surf stores for eight years and having 18 staff, making an estimated 21,000 boards during that time. Chapman Designs also had a clothing line it was huge in Japan and Australia… it was crazy times; especially in Japan they treated me like a celebrity. This ran its course and I was forced to re-invent myself. I have to thank Jamie Mitchell and co who I saw surfing a 12” SUP’s at Burleigh Heads, and thought wow this could be the way to go! My business originally kicked off producing surfing short boards, now in 2018 I’m producing foil surf boards and foil stand up paddleboards. The company has moved with me to follow a sport that I’m personally passionate about and heavily involved within. stand up paddling. My first board was a 27’’ wide one (the biggest blank Burfords had at the time). Things have certainly progressed over the years, my latest design being a DC Foil Surfboard 4’6 x 20” 1/2. Over the past 40 years I surfed throughout some amazing locations, Indo, Maldives, Papua New Guinea, and my all-time favourite break Burleigh, Gold Coast. Ive also had the luxury of stand up paddling, surfing and foiling locally within numerous competitions, and contests. Most importantly I have had the opportunity to teach kids and adults to surf, downwind and paddle on the flat whilst exploring our beautiful world from the water for over 30 years. The reason I started this business was to fuel my passion for this incredible sport. Most importantly I really like to see my customers and friends, from beginners through to the elite on the water with massive smiles on a wave or a runner!